For the genesis of thes remarkable contests, start below at *START HERE. Challenges for the title or other developments will be added the top of this page as they arise. Beryl and Robin's grandsons* have recently taken their T-shirts to Florida - the same ones as they took to Vancouver (see Challenge 1 below), but since laundered. They now challenge for the Most Travelled T-shirt(s) record. My calculations are as follows: Heathrow to Florida and return is 8,620 miles. Add this to the 9,380 miles they have already clocked up, and the total is a round 18,000 miles. I therefore declare Beryl and Robin's grandsons* to be the holders of the Most Travelled T-Shirt Record. This effectively nullfies the Most Travelled But UK Based T-Shirt Record which they already held anyway so there. d) staying awake while suffering from jet-lag during the photo shoot. 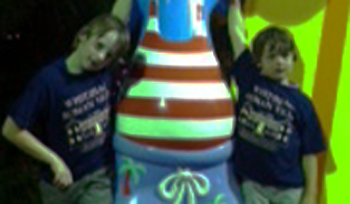 *William (nearly 10) and Thomas (just 8) Lloyd. Alan's furthest distance was 3,545 miles, which does not beat the current record for Most Distant T-shirt. The total distance travelled was 7,384 miles, so, even adding a few miles for travel around the detsinations, the current Most Travelled record holds (in both versions). Sorry Alan. Brave attempt though. 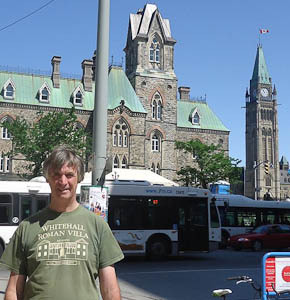 Your photos show that you travelled with two (at least) T-shirts: had they been of the same colour, this would have remained un-noticed. But you made no special claims to take this into account until I mentioned it, so I deem that you got away with it. Future contestants should note that the competition concerns the travels of a single T-shirt. Under no circumstances will distances be multiplied (or indeed divided) to account for a multiplicity of T-shirts. 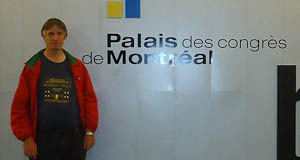 Nor will I start a competiton for the "largest number of T-shirts per person taken on a trip". Sorry again Alan - but, if it's any consolation, were there such a competition you would be currently the record holder. 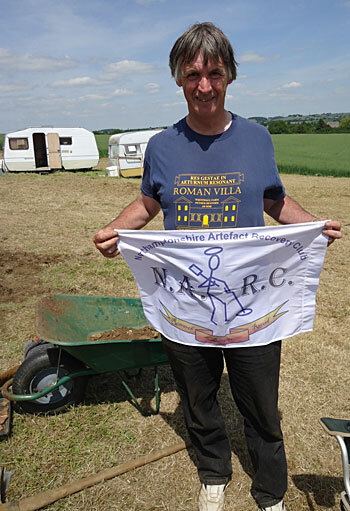 I thought I’d send in an entry for the most travelled Whitehall t-shirt & club flag competition. As of this coming weekend, both the t-shirt and the NARC flag are embarking on a tour of very very very very west Wales [called North America! ], where I hope to get some pics of both flag and t-shirt sent over to you. However, the journey begins today [Tues] at whitehall. Will keep you informed of progress. Regretfully I will not be at the dig this year, so best wishes to all concerned. I hope it goes well for you all. Now, I'm not going to fall for that one again - creating a new competition so you'll be bound to win it! 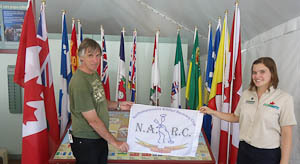 So this challenge will be judged purely on the rules of the existingh contests: in other words, club flags don't come into it, althought it will be nice to see the NARC flag flying in North America - if they don't get arrested by the Feds for promoting narcotics! The crow-flight distance from Whitehall Farm to Torfino is (in case you need reminding) a blistering 4,680 miles, so I am very happy happy to declare Beryl and Robin's grandsons to be the new Most Distant T-Shirt record holders. Assuming the return journey to be twice the distance, I declare Beryl and Robin's grandsons to be also the new Most Travelled but UK based T-shirt record holders. A friend has suggested to Mr. Kesten as follows: "... As I have embarked on my project in Turkey and may shortly do so in Kenya, are there any rules that say the T shirt has to travel with the owner? The competition title only mentions the T shirt travelling; for a small alcoholic consideration I could take it with me...."
The competition does indeed refer to the T-shirt, while the question of ownership left open. However, I would wish to rule out any possibility of a T-shirt being sent by post to any part of the world to be photographed being worn by, say, the Assistant Under Postal Master General (retired) of a small but picturesque fishing hamlet in Tonga. 2. I am of the opinion that whether the person mentioned in 1 above is the recognised legal owner of the said T-shirt is not pertinent to the matter. Should sentiment or ethics (rather than the game-rules) demand that the T-shirt travel with its legal owner (or vice versa) it would always be possible for ownership of the said T-shirt to be transferred to the person mentioned in 1 on a permanent or temporary basis. I trust this judgment satisfies. However I am concerned that the T-shirt might be sent from your address by post to your friend so that he might travel with it. I deem this to be acceptable, provided the postal transfer were to occur entirely within the UK (as previously defined, and still including Scotland, just). Well the flood of challenges continues unabated and we may well have to take on more staff to cope. I understand there will be quite a few well-qualified nurses looking for jobs soon, so we may be in luck. 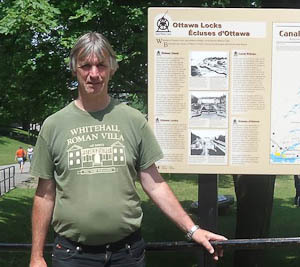 T-Shirt on a trip to the USA. His friend Alan The Librarian then travelled to Israel and back in a Whitehall T-shirt (I'm not sure he was actually wearing it all the time - I rather hope not!) 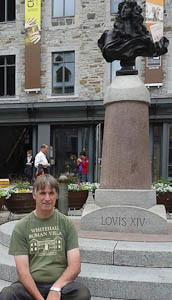 to establish the Most Travelled T-shirt record (14,760 miles). 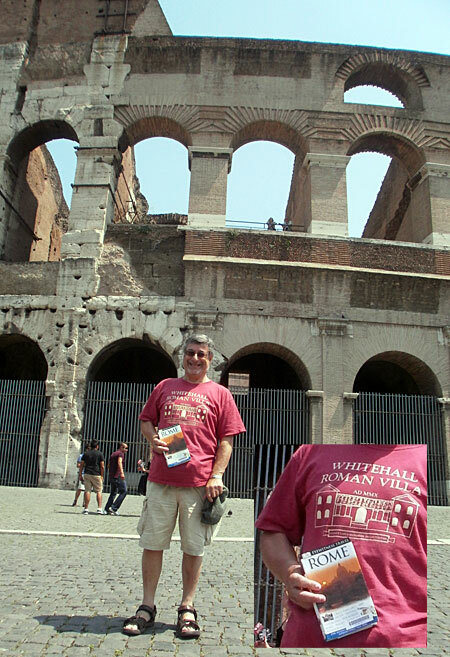 Tony obviously wants to consolidate his position as he has suggested a Most Travelled but UK-based T-shirt (MTBUKBTS) competition and poposed himself as the current record holder after wearing his USA travelled T-shirt in Rome. The Rome caper adds 1,782 miles to the 6,876 miles of Heathrow to Moneticello and return, giving a total of 8,658 miles. Admittedly the building behind him does bear a passing resemblance to the Colosseum which is indeed in Rome. But the rather sneeky holding of a travel guide to Rome (see inset) rather suggests to your judge that Mr Kesten is over egging the evidence, presumably because he is guiltily anxious of being uncovered in a subtle but dastardly ruse. My verdict is that Mr Kesten must be given the benefit of the doubt. Technically, Mr Kesten is the record holder for the new MTBUKBTS competition; but should Challenge 1 be validated by photographic evidence, then that (I deem) would also qualify for the new competition and would beat Mr Kesten's record by 702 miles. For the record, the Judge (me) would like it to be well known that he will not entertain any proposal for a Most Travelled, When Worn By A Retired Civil Servant Called Tony, Whitehall T-Shirt competition. We have a challenger for the Most Distant T-Shirt. 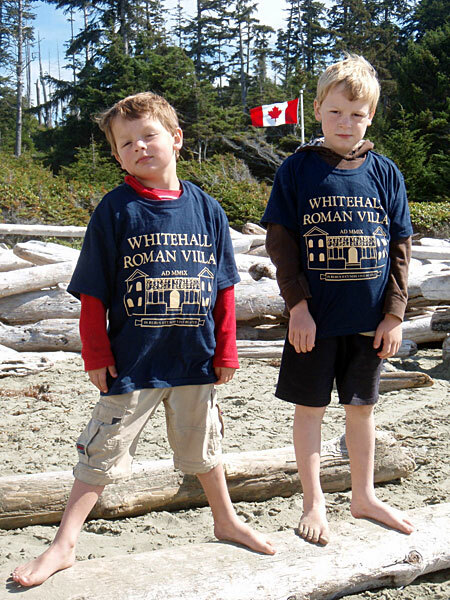 Beryl and Robin's grandsons visited Vancouver Island in Summer 2010 and were photographed wearing their Whitehall T-shirts at Torfino in the Pacific Rim Park, with the Pacific Ocean in the background (nice romantic touch that). The crow-flight distance from Whitehall Farm to Torfino is (in case you need reminding) a blistering 4,680 miles. When I have received the photos, I will be happy to declare Beryl and Robin's grandsons to be the new Most Distant T-Shirt title holders. The crow-flight return journey distance is 9,360 miles, and even if the flight was via New York or somewhere else in the East or centre of Canada/USA, the total distance travelled will be less, I believe, than the current 14,760 title holding record (see below). However, I am minded to accept appeals against this judgment, provided that detailed itineraries be supplied. I donated a copy of each of Ruth's three books to the Public Library in Monticello NY and a Whitehall T-shirt to the Librarian who is an old friend of mine from Woodstock days. I thought you might like to see the picture and even, perhaps Jeremy, put it in the blog? Alan the Librarian is also interested in archaeology and goes to a dig in Israel. 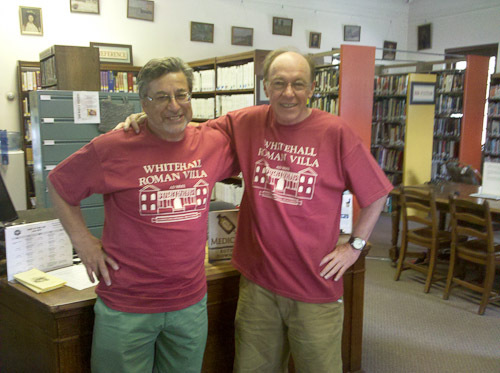 Whitehall Villa to Monticello NY is 3,400 miles (as the crow flies). 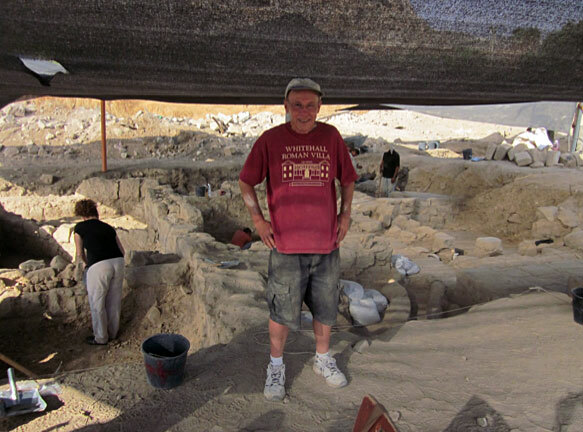 So far Alan's T-shirt has travelled its record holding 3,400 miles plus the 5,654 miles from Monticello to Tiberias. If Alan takes the T-shirt back home with him, it will have travelled a further 5,654 miles - a grand total of ... (I'm running out of fingers and toes)... 14,708 miles! (But please see below re Legal Challenge). Unless we can get an astronaut or airline pilot to wear a Whitehall T-shirt, I doubt that this "distance travelled" record will be broken very soon. A certain T.Kesten has made a legal challenge to the result of the Most Travelled T-Shirt Competition (MTTSC). He claims, through his solicitor, that the distance awarded is incorrect on the grounds that the said Alan the Librarian ravelled from Montincello NY to Tiberias, Israel, via Heathrow Airport in the United (Currently) Kingdom of Great Britain and Northern Ireland. Assuming Alan the Librarian travels home via Heathrow (a not unreasonable assumption in the eyes of His Honour the judge) the total distance travelled is: 14,760 miles (a full 52 miles further than previously judged - well worth the legal fees). Evidence of a different total distance based on air miles awarded will not be taken into account on the grounds that Air Miles are immoral in a warming climate and I hardly ever earned any, or if I did I only ever used them to upgrade from tiny uncomfortable seats to business class seats that were wide enough for me not to have my left shoulder bashed every time the trolly went by even when I complained to the chief steward who turned out to be the one driving the trolly and it was American Airways and I hope they go bust oh they did I think good. ** the initial journeys from Whitehall Villa to Mr Kesten's residence in or about Milton Keynes, and from there to Heathrow are not included. 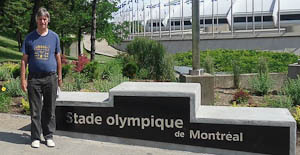 It has been ruled that travel only outside the UK (meaning outside its constituent parts as of 1st November 2010), including the distance from the airport or port of departure to the territorial water limits of the UK, will count for the MTTSC. Given the distance established as the record, it is unlikely that travel inside the UK could ever mount a challenge, so it is unlikely that a legally credible argument for rescinding this rule could be mounted. That, or course, will not stop the b*****s trying. � Copyright of this web site, including all text and images (except where otherwise stated), belongs to The Whitehall Farm Roman Villa and Landscape Project. No part of this website may be reproduced in any form without the prior permission of the Project.